Welcome back to the forest! We hope that you all had a truly wonderful time over the Christmas holidays. 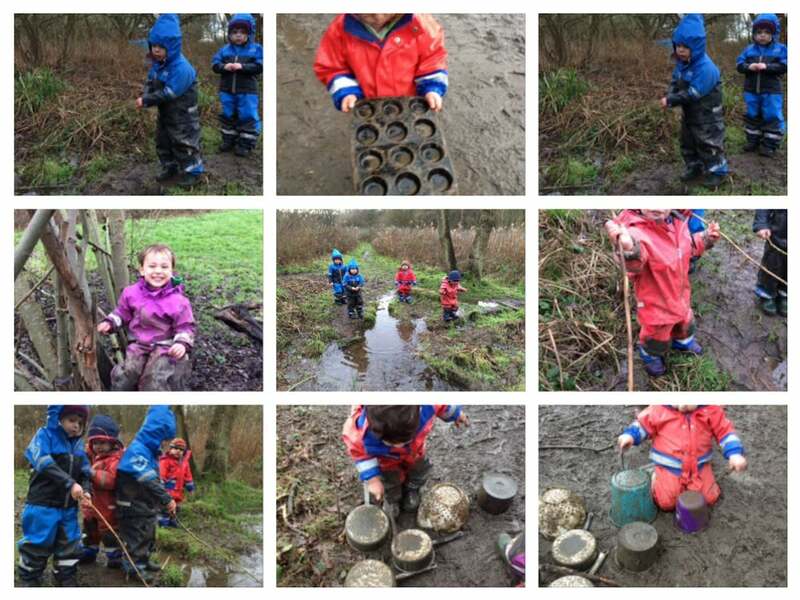 It was fantastic to see the children back in the forest this week and even better was that there was plenty of lovely, squishy mud for them to play with. Our mud kitchen was very busy indeed this week as the children made mud pies and other muddy delights. There was lots of free play splashing and jumping in puddles, the children also used their imaginations to build a pirates ship upon which they set sail but they had to watch out for that pesky shark! They also went exploring to find long sticks to use as rods to go fishing in the puddles. And their creative skills were in full swing when the forest came alive to the sound of music as the children used pots and sticks as drums. In our cookery lesson this week the children made delicious cauliflower cheese and scrumptious pancakes. And in other exciting news, Little Forest Folk celebrated its first birthday this week! We'd like to take this opportunity to thank all parents for supporting us throughout our first year. Start spreading the news... Little Forest Folk is growing! Following the success of our wonderful Wimbledon nursery and after the demand from London parents for more outdoor, active, nature and play based education for our little ones, we are delighted to announce that we will soon be opening two brand new London nurseries for 2-5 year olds in Spring 2016. Our Wandsworth nursery will operate from the Naturescope Centre on Wandsworth Common with our Chiswick nursery operating from the Piccolo Playcentre on Duke Road in W4. Both nurseries will run in a similar fashion to our Wimbledon nursery. We are aiming for both nurseries to be open for full time care from the start of the summer term, which is Monday 11th April. A little closer to Spring we will be hosting some open days which we're very excited about but in the meantime we will keep you updated with our progress. And of course we'd love to get the word out to as many parents as possible, so please do help us spread the news, thank you! We're looking forward to more fun (and hopefully mud) in the forest next week.